Top end of Trail at intersection of logging Rd. 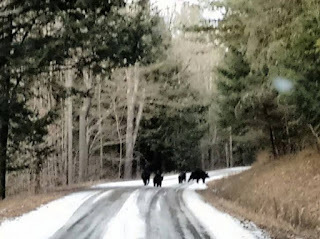 Mom and 3 cubs on Painter Leetonia Rd. Before we got to camp a good sized coyote ran across the front of the car. He looked very well fed and was in a hurry to get out of our way. Today it was 63 degrees on top the mountain at the end of Trestle Hollow Trail. 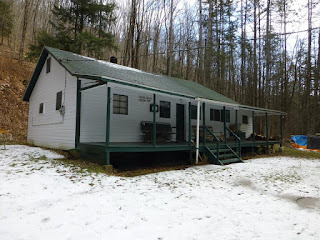 Lee and I have been up to camp every weekend with the weather staying warm and very little ice and snow. 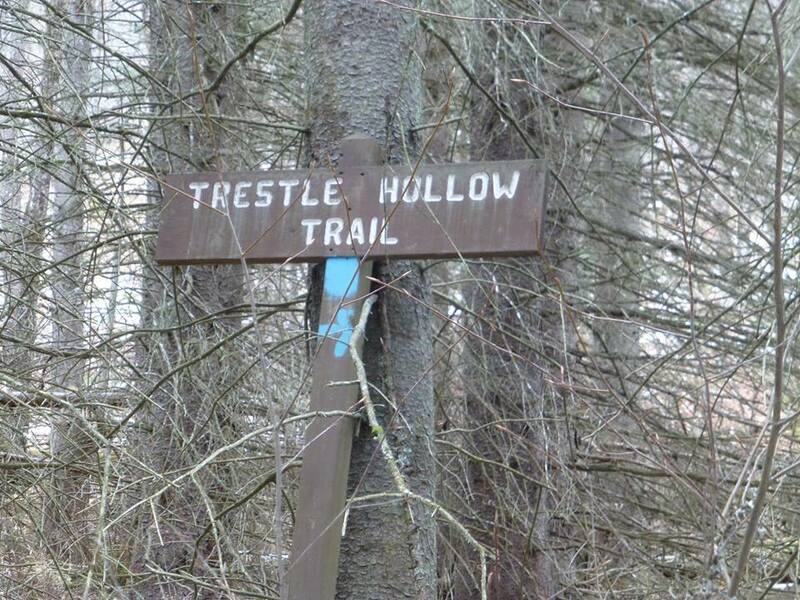 We walked the about 2 miles of Trestle Hollow over to West Rim. The first part of the trail has obviously been cared for by someone cutting limbs and trees out of the way. The second part was not as well maintained as the first and needs some tender loving care. Along the trail we saw a lot of turkey tracks and a few deer tracks and pawing of the ground looking for food. We hiked in light shirts without jackets with the weather so warm. After the trail we headed up Painter-Leetonia and there to our surprise was a mom bear and her 3 cubs. They were taking advantage of the good weather and low snow cover to look for food as well. Mom and cubs looked on the small side even though the cubs were obviously born last year. So it was a good day in the woods. I didn't want to leave. Mountain girl, Paula, logging out. Climbing up to Cushman from Francis Leetonia Rd. Lee and I were up in Leetonia again this weekend as the weather has stayed mild. 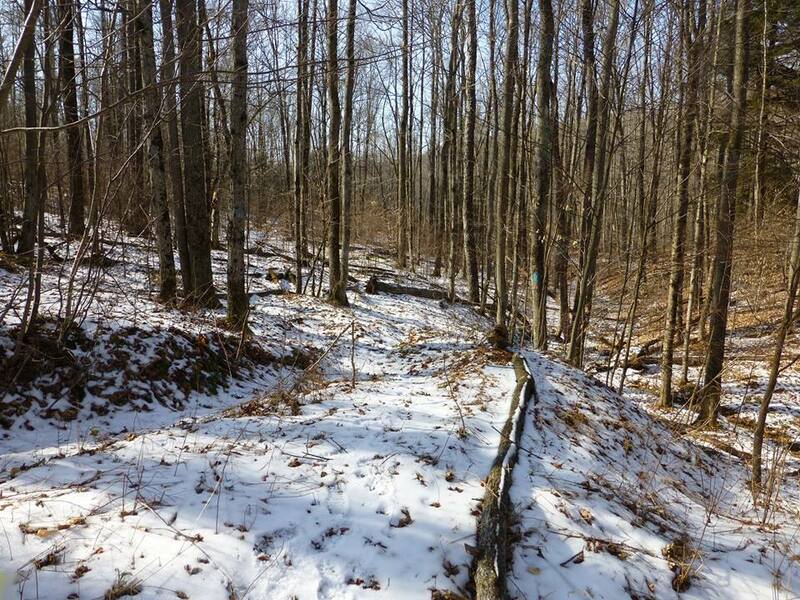 It was between 34-36 degrees on our Misner Trail, Francais/Leetonia Rd, Cushman, Leetonia road loop about 9 miles. The only surprise on the trail was the top of Misner trail is covered in cut trees as they are logging up there. That made for a difficult last 200 yards of climbing over, under and around the trees. We saw several deer tracks and heard a dog barking. Now I know some of you are saying that was probably a coyote. But unless a coyote has developed a very low bark like a shepherd size dog, I am pretty sure it was a dog. The way the mountains echo it was difficult to figure out where it was coming from but we heard loggers as well so thinking it might have been one of their dogs. The last half mile of the top of the mountain was very foggy. I don't think we could see more than a couple hundred feet at times and about 3 degrees colder than the bottom. The footwork on the road was a bit tricker than I planned for a took a knee slide at one point. That will teach me to remember my ice cleats...guess being in town has already made me forget the basics of winter in Leetonia. The roads weren't bad for cars if you go slow no chains are needed today. We said, hi, to Mick as we passed his spot overlooking Cushman although you couldn't see a thing today with all the fog. The sign for Cushman View was missing last year and now the post resides over the hill. By the time we made it to the Corner of Leetonia Rd. and Wilson point Rd. we were glad the rest was downhill. It was nice medium jacket weather hiking as long as you were moving it was comfortable. All in all we covered 9 miles in about 4 hours which included lunch and a few breaks as we made it up about 900 ft of elevation climb. We have been glad the weather has stayed mild and hope to squeeze a few more trips up before the roads close. Mountain girl, Paula, logging out. You know the old saying, "You don't know what you've got til it is gone," is so true. 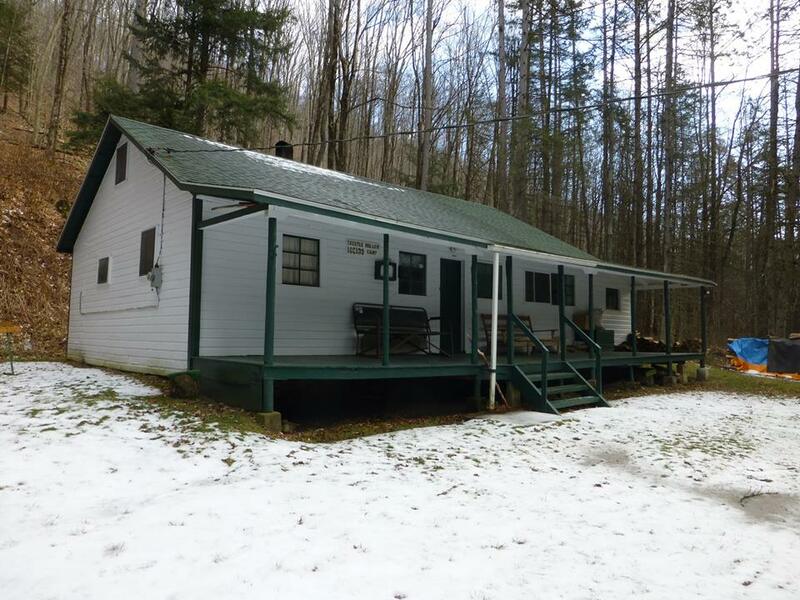 Now that I can't just walk out the door of the cabin and go for a hike. I have to drive to get back into the woods. Drove down to just outside of Arnot and walked down to Sand Falls. It is a very beautiful falls and pretty easy to get to. 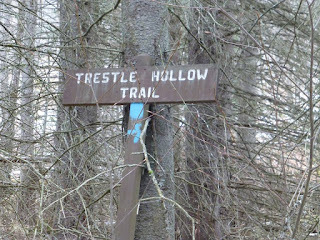 It is on the Mid State trail and I am sure quite a treat for any hikes doing the complete trail. I walked on a bit of a short cut to falls which was about a 1.5 to get to falls all downhill at a fairly gradual pace until you get to the falls. At that point there is a rope to help slow your descent down to the falls and help you climb back up the about 25 foot drop. It was just under freezing today and a very light snow, but quite warm for this time of year. I enjoyed my visit with nature and will be going up to camp tomorrow to check on things and who knows do another little walk up the mountain. My job change that doesn't require the kind of physical labor I was doing before I moved to town has put a few extra pounds on the mountain girl so time to walk them off and what better place than in the mountains and woods I love. Mountain girl, logging out.